Set the gear on high because we're going on a fast ride with the best cartoons about cars on SeeZisKids! 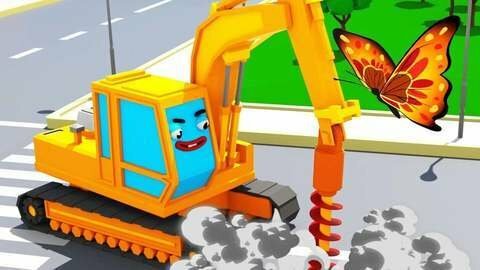 Meet our top episodes of the car cartoons for kids about the police car, race cars, monster truck, construction vehicles, fire trucks, and many more cars. These new car cartoons for kids will surely catch your kid's eye. Packed with amazing races, car crashes, and exciting cars’ adventures they attract your kid's attention. Enjoy these non-stop police car cartoons, monster truck cartoons, and race car cartoons as they play non-stop. These colorful HD cartoons will tell you stories about your favorite cars. The Police Car, Monster Truck, Race Cars, and Crane have never looked so real before. These funny cartoons about cars for kids will remind you of the best racing video games! In these car cartoons for kids, the cars always get into funny, sometimes even dangerous accidents. Thought, whatever happens, the cars help each other and learn moral lessons. Watch 3D cartoons about cars for toddlers online for free on SeeZisKids. We know how important for a baby not to waste time watching videos but learn something new and useful. These 3D cars cartoons will teach babies how to follow the traffic laws, how to help others and how to work as a team. Watch VIDS for KIDS about trucks and other cars in 3D online for free!